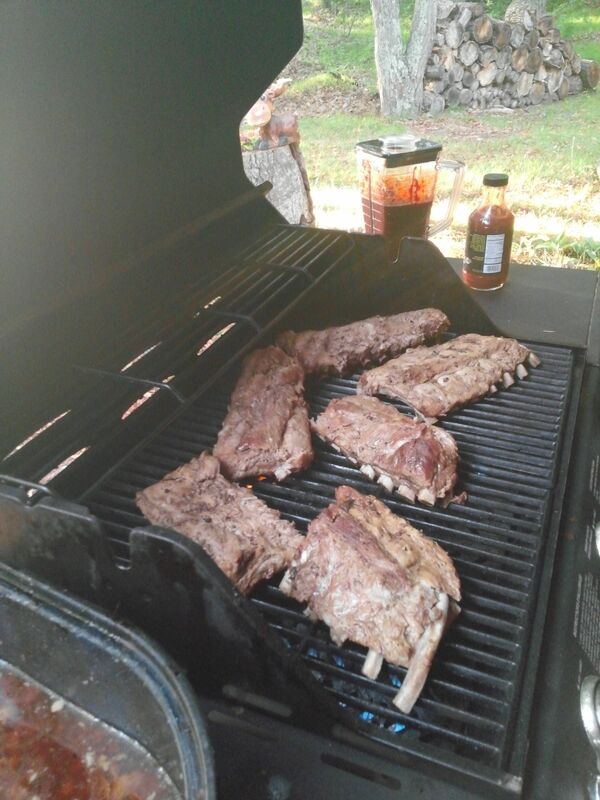 Finishing the ribs on the gas grill: saucy! 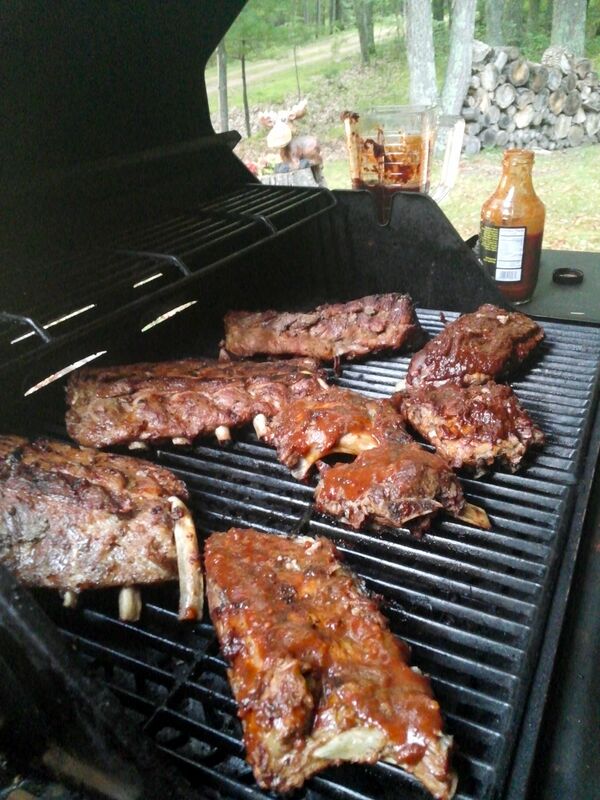 Here’s a meal from a month or two ago, in the northwoods with my family: barbecue baby back ribs. Obviously there are a zillion other recipes and recommendations for how to do these, so I’ll just add my 2 cents worth about how I did them. 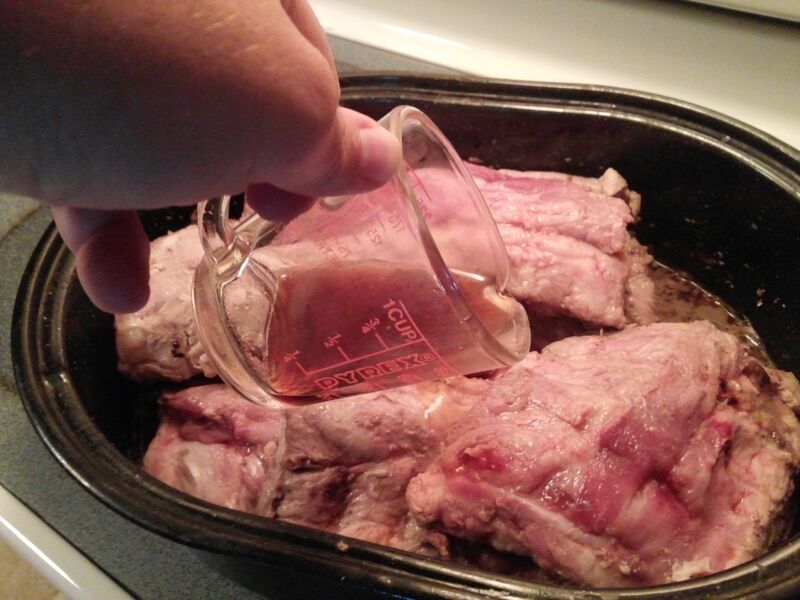 I started by cooking the thawed ribs in a couple pints of a nice brewery-fresh scotch ale, in a roasting pan. Overall this was at 250-300° F for 3 to 3 1/2 hours. I progressively raised the temperature to try to hit the desired dinner time. 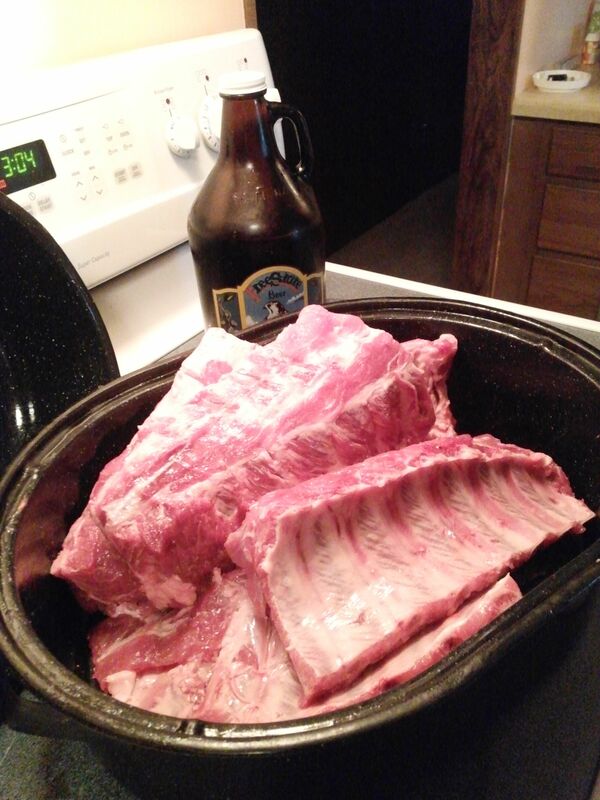 Preparing the ribs for pre-cooking, with a pint or two from a growler of scotch ale. Meanwhile, I prepared a blended, sugar-free, somewhat spicy barbecue sauce from dried ancho and chipotle peppers, fresh lime juice, pan-roasted garlic cloves, mexican oregano, water from rehydrating the peppers, a bit of olive oil and a touch of salt. 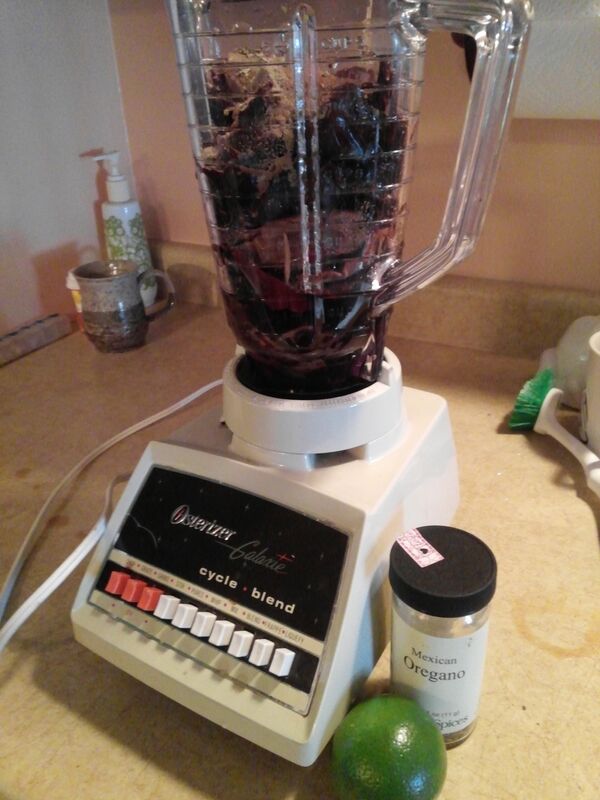 Preparing a sugar-free chipotle and ancho chili BBQ sauce. During the pre-cooking phase, I occasionally turned and basted the ribs with some water from rehydrating the peppers. Pre-cooking the ribs in a covered roasting pan with a nice scotch ale and water from rehydrating the dried peppers. 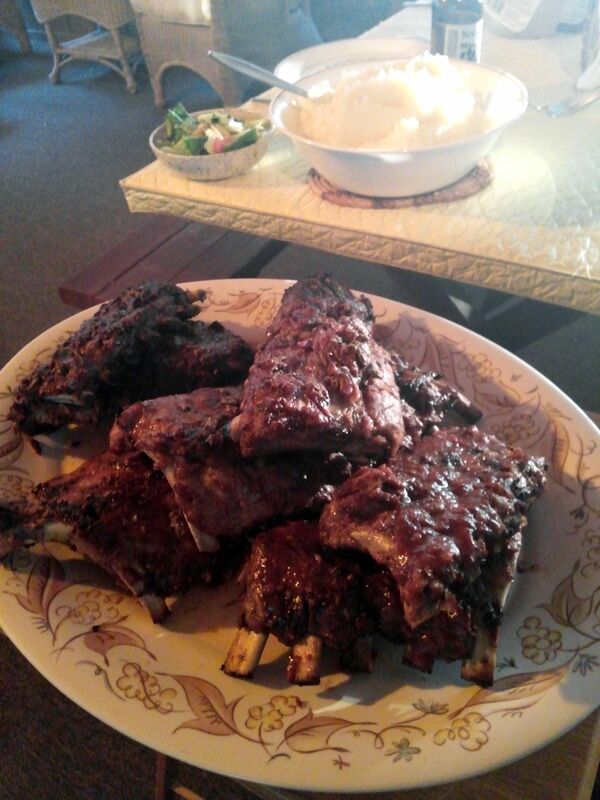 Once cooked, I finished the ribs on the gas grill. Finishing the ribs on the gas grill. And toward the end of cooking, slathered the ribs with a couple of barbecue sauces: mine and a store-bought sauce, that was my brother’s pick. As you might know, usually you are warned not to put the sauce on too early because the sugar will burn…. that’s not an issue with my sauce. A family dinner with BBQ ribs out on the porch at around sunset. Overall, these turned out tender and great. I’m definitely a fan of barbecue sauces without sugar… it’s often just not necessary to have BBQ taste great! I offer this hiatus as evidence that I do have a job… actually, I was doing my research work and also had a nice week visit to San Diego for a workshop and to visit old and new friends. So, lets catch up with some quick-and-dirty foods. 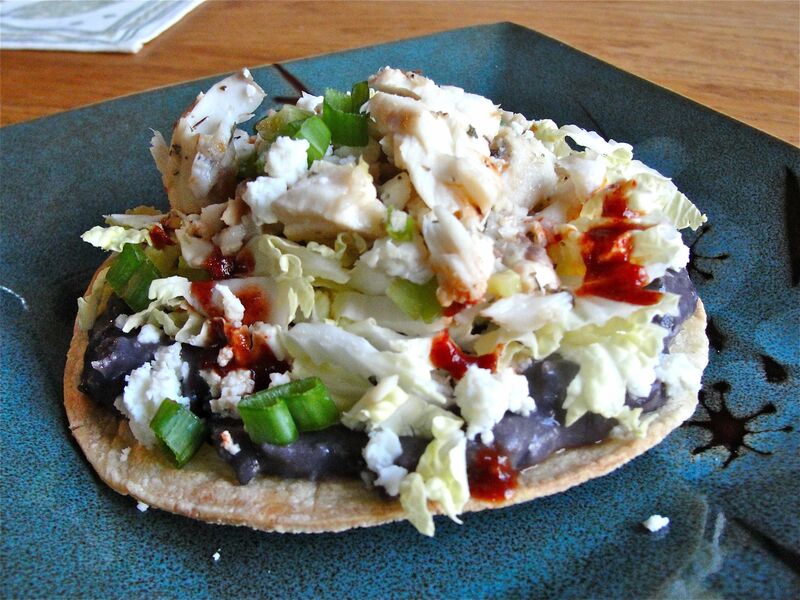 This one is simply a serving suggestion: tilapia tostadas… mashed black beans, shredded napa cabbage, queso fresco, and a tilapia filet (from frozen, defrosted in water and patted dry) lightly pan-fried in oil with oregano, salt, pepper, and a jalapeno hot sauce, and scallion greens, all atop a crisp corn tortilla. One tip I have for you is to buy corn tortillas and bake them in the oven to crisp them, rather than using those “hard” deep-fried corn tortillas for tostadas. I like the way Chinese restaurants often cut carrot for presentation in their dishes. This is simple technique to make carrot slices that are much more attractive than round pieces! 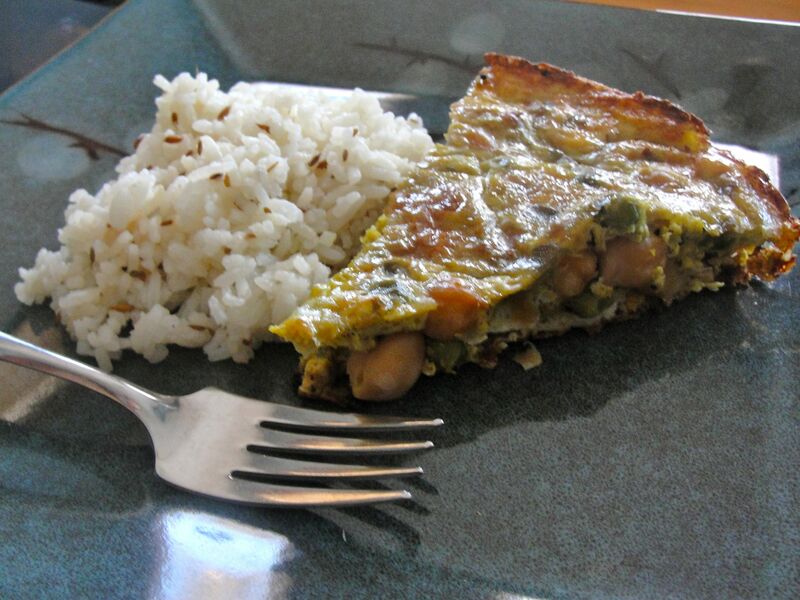 You can keep leftover rice, i.e., sticky rice, as individually wrapped servings in the freezer. Then thaw them in the microwave on their own, e.g., to use to make fried rice, or top them with your favorite accompaniment, and reheat them together. Microwave perhaps 1 1/2 to 2 minutes on high.